Homemade fish fingers are easy to make and cook in no time. Plus you know exactly what's in them! Try them in a pitta sandwich with spicy mayo. In a shallow bowl whisk the egg. In another bowl combine the breadcrumbs and paprika, season with salt and pepper. Dip the fish fingers into the egg, making sure they are completely coated and shaking off any excess. Then carefully dip the fish fingers in the breadcrumb mixture to coat them all over. Heat the oil in a large frying pan over a medium-high heat. Fry the fish fingers for 2-3 minutes on each side until golden-brown and cooked through. Remove from the pan and drain on kitchen paper. While the fish is cooking combine the mayonnaise, curry powder and lemon juice in a small bowl and set aside. 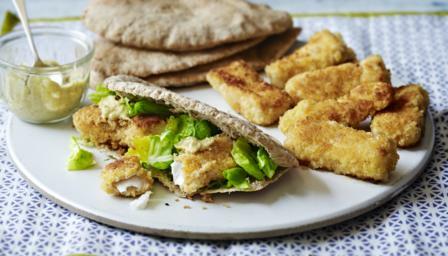 Serve the fish fingers in wholemeal pittas with the mayonnaise and lettuce.